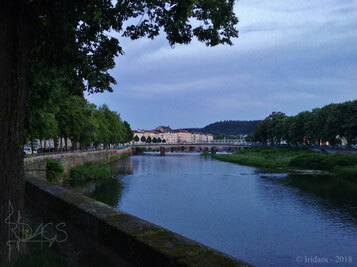 The 2019 edition of the Imaginales festival will take place from the 23rd to the 26th of May, and it is with great pleasure that I will return to run the Ylsthia stand in Epinal’s Parc du Cours. Yes, this will indeed be the fourth time, and this time around… there will be quite a few changes ! I had been thinking about reorganizing the stand’s layout for some time now, in order to make it more open and welcoming. The previous edition of the Imaginales convinced me this could be a good thing, and I began drawing all kinds of little plans right after I got back, to help me figure out which changes I could make. I was even more encouraged in this direction when the time came to sign up for the 2019 edition. Indeed, when I saw that the big tables now had to be paid for, I quite simply decided to do without them. 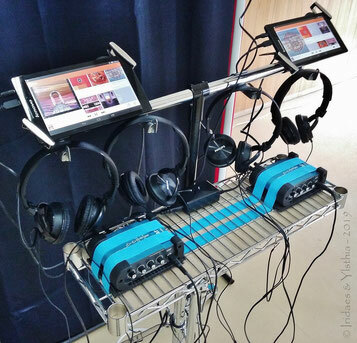 Participating in the arts and crafts fair in Cocherel allowed me to test some of my ideas, notably the brand new installation for the listening devices (see picture on the right). The way in which the different albums will be presented is still being designed, but the definitive aspect is almost complete. The most notable addition, compared to the previous editions of the festival… is that this time I will be performing on the stand. 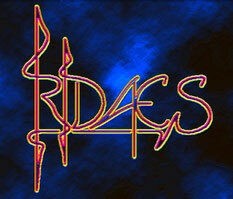 Yes, I will have one of my synthesizers with me, and I will play various pieces throughout the four days. These mini-concerts will take place at regular intervals, so that anyone may enjoy them at one moment or another. So there you have it. A nice little metamorphosis whose prime goal will be to make the Ylsthia stand more lively and friendly. True to myself, I will be happy as ever to chat and sign my CDs. One last thing I must specify : as it is the case every year, the exact location of the stand in the Parc du Cours won’t be known until the very first day of the Imaginales. Be sure to check my Twitter account on the morning of May 23rd. Best regards to all, see you soon ! Finding markets and fairs last Christmas was only the beginning. 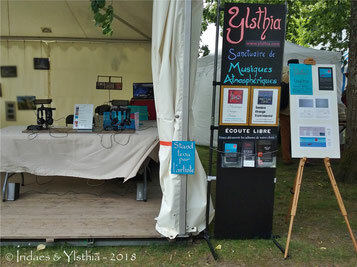 I kept on searching, and it is with great pleasure that I bring you the news that the Ylsthia stand will be setting up at the arts and crafts fair in Cocherel (in the Seine-et-Marne region). 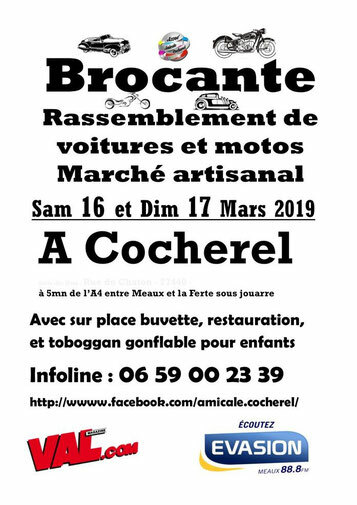 This event will take place in the village hall (also known as Grange Bellevue and situated in the Rue de Chaton street). My touch tablets and headphones will naturally be back (so you may hear any album you like), and I will be – as always - happy to sign the CDs. 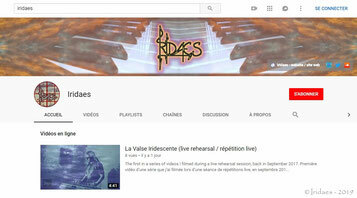 My YouTube channel has been launched ! 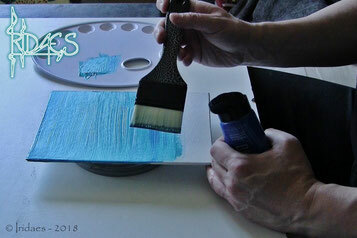 When I first started uploading my videos, my initial intention was to focus all my efforts on Vimeo. However, this approach did not prove as fruitful as I had hoped, and I gradually came to the decision of launching a YouTube channel. And now… it is finally up and running. I invite you all to check it out, simply click right here. 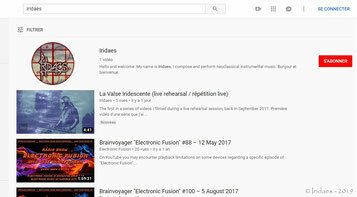 Yes, there is already a video online, a live rehearsal version of “La Valse Iridescente”, which was filmed and recorded in September 2017. Regarding the videos I posted in Vimeo, they will remain there exclusively for now, so you can still see them by clicking here. Happy New Year to all, best wishes for 2019 ! Ylsthia stand from the 7th to the 9th of December 2018, in Puteaux ! 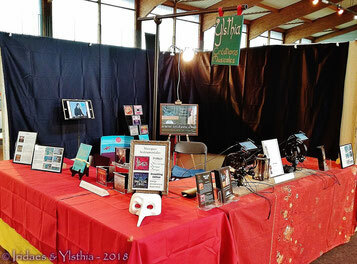 Only two weeks after the Saint-Prix arts and crafts market, I happily return to once again run the Ylsthia stand, this time in Puteaux. 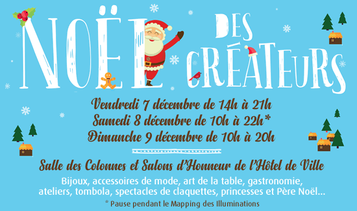 From the 7th to the 9th of December 2018, City Hall will be hosting the Christmas arts and crafts fair (Salon de Noël des Créateurs). The listening devices will be there, so you may hear any album you choose, and I will once again be happy to sign my CDs. Best regards to all, see you soon. 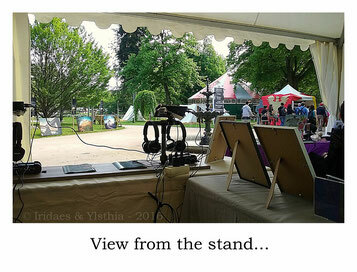 Ylsthia stand on November 24th and 25th, at Saint-Prix ! 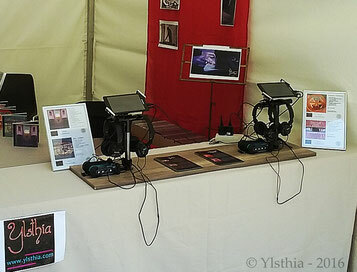 Yes, the Ylsthia stand returns, this time at another event ! 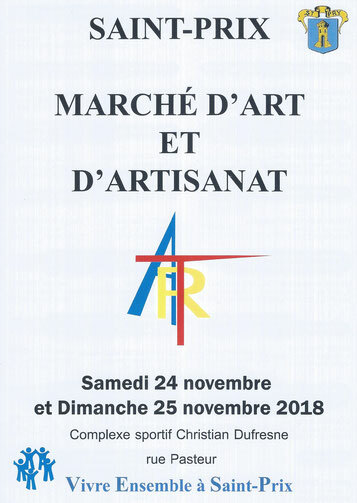 On Saturday the 24th and Sunday the 25th of November 2018, at the arts and crafts market (Marché d’Art et d’Artisanat) in Saint-Prix (in the Val d’Oise region), I will be there to present my music, sell my CDs, and… sign them of course ! This market will take place indoors at the Christian Dufresne sports complex (situated in the “rue Pasteur” street). Opening times will be from 10 AM to 7 PM on Saturday, and 10 AM to 6 PM on Sunday. As always, the touch tablets and headphones will be present, so you may listen to any albums you wish. "Ebsythria" finally available on BandCamp ! 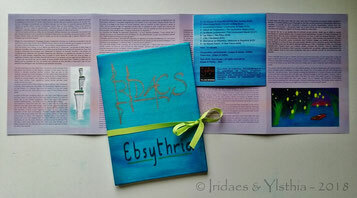 Yes, my concept album "Ebsythria" is now available ! Alongside this article, you can see pictures of the CD version, with its 21 x 15 cm booklet (21 x 59,6 cm open) and handmade pouch. 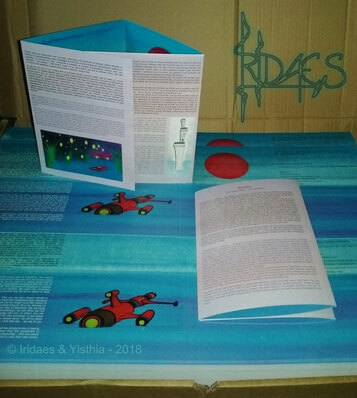 As promised, the download version includes the content of the booklet (short story and illustrations) in PDF format. Enjoy listening, and... reading as well ! 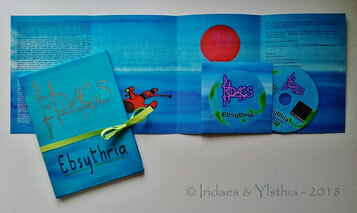 « Ebsythria » : my first true concept album premieres at the Imaginales ! Once again, the CD version of my new album will be exclusively launched at the Imaginales festival (at the Ylsthia stand, in Epinal’s Parc du Cours), before being sold on BandCamp towards the beginning of June. “Ebsythria” is already my fourth album, but it bears a notable difference in that it is my first fully-fledged concept album. It is true that “Navigation” somewhat comes close to that description, but “Ebsythria” is more than worthy of the title, since the seventy minutes of music are accompanied by a nice 21 x 15 cm booklet (21 x 59,6 cm when open) featuring a short science-fiction story (in english and in french) I wrote and illustrated. And as if that weren’t enough, the CD and booklet are contained in a nice pouch which I have painted and assembled. I have been wanting to release something a little more elaborate for quite some time now, and I am pleased that it is finally the case ! Regarding the music itself, its immersive and futuristic character fits the story perfectly. And still, it remains as melodious as everything I have released so far. Naturally, “Ebsythria” will also be available for download. The content of the booklet will be included as a series of files. Imaginales 2018, here I come ! 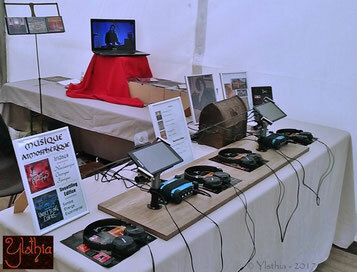 After running the Ylsthia stand there for two years in a row, I definitely feel I have my place at the Imaginales festival. And it is a truly enjoyable feeling, given what an awesome festival it is. Once again, I am looking forward to meeting you all and sharing my music. Not only will I be selling my CDs, I will also be happy to sign them, as always. Naturally, my trusty listening devices (touch tablets and headphones) will allow you to check out any album you desire. 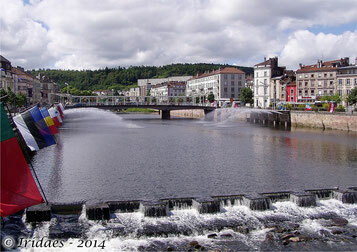 The Imaginales festival will take place in Epinal, from the 24th to the 27th of May 2018. 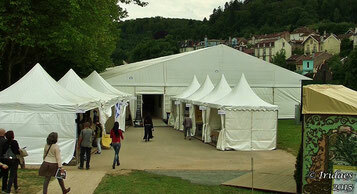 Most of the events and all of the stands will be situated in the Parc du Cours. 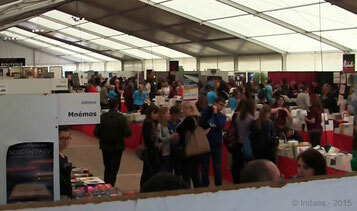 The exact location of the Ylsthia stand will be specified on the very first day of the Imaginales. Make sure to check it on my Twitter account ! 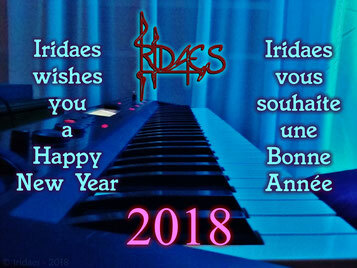 Happy New Year to all, best wishes for 2018 ! 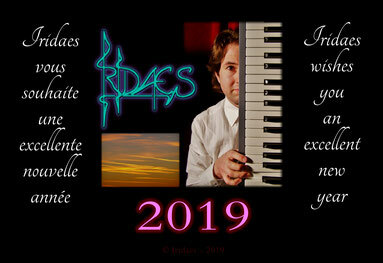 Release of my third album "Passage"
By focusing – as early as January - on recording my new album, I was not only hoping to finish it before the end of the first semester, but also preferably before the beginning of the Imaginales. 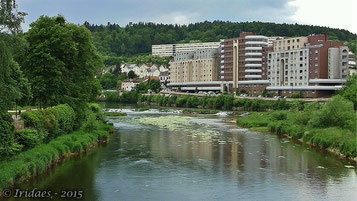 The renown Epinal festival has indeed become a key event in my calendar, and hadn’t I been able to present any new work there, I would have felt like I was dropping by empty-handed. With all the tracks that were gradually adding up, recording and mixing sessions alternated in an almost relentless succession, and the album was finally finished just in time. However, all this work wound up mingling with the preparations for the Ylsthia stand. 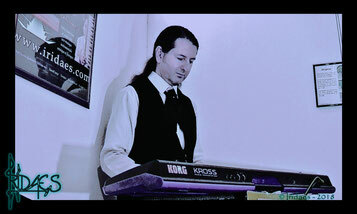 It therefore became difficult, during a few days, to keep my various websites (including those of my label) up to date. Which is why I am only now announcing my third album’s release, two weeks after the official date. But all of these efforts (and adjoining interferences) paid off in the long run. 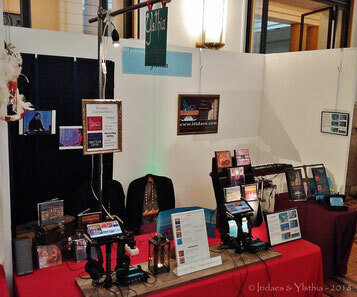 Of all my albums, “Passage” is the one that sold the most during the Imaginales festival. Definitely a very pleasing start. 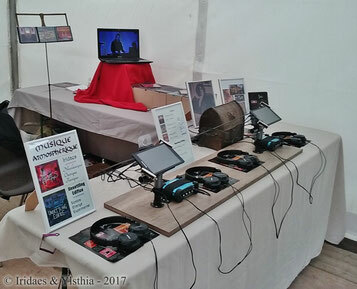 Imaginales 2017 - I will be back behind the Ylsthia stand ! The good news has just been confirmed. My label Ylsthia will have a stand at the 2017 edition of the Imaginales festival, in Epinal. As always, it will mainly take place in the Parc du Cours, and that’s where I’ll be from May 18th to 21st, running the stand, selling my CDs and, of course, signing them. Listening devices (tablets & headphones) will once again be available (allowing anyone to select and discover any album they choose), and I will be happy to chat about my work with anyone who wishes to know more. The Imaginales' website is in french. 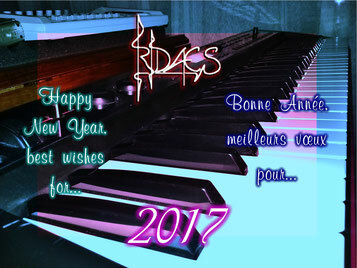 Best wishes to all for 2017 ! 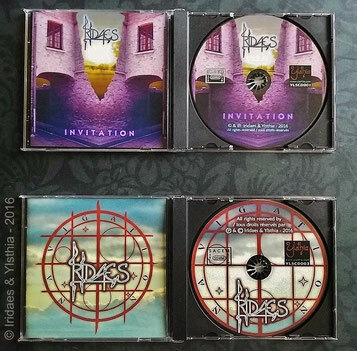 "Invitation" and "Navigation" CDs now available on BandCamp ! Yes, after many meticulous packing tests and shipping price calculations, this is it, the CD versions of my two first albums are finally available on my BandCamp page ! Any album of your choice can be signed. Just make sure to ask for it in your order, and don't forget to speficy the names that are to be mentioned. 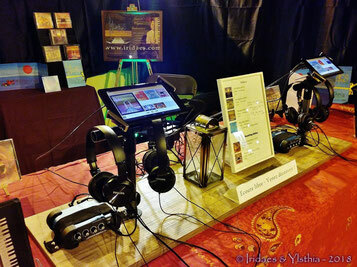 Running the Ylsthia stand, at the 2016 Inaginales festival, was a very enjoyable and enriching experience. I therefore wrote a detailed account of my stay, complete with a nice little selection of pictures.